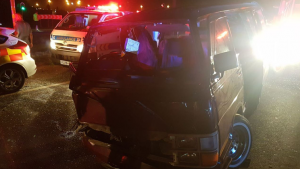 Transport Minister Blade Nzimande has condemned motorists who continue to contribute to road crashes that result in fatalities. This comes as head-on collisions continue to claim many lives. In the latest crash, 13 people were burnt beyond recognition following a crash involving two taxis and a light motor vehicle between Bethlehem and Fouriesburg in the eastern Free State Saturday morning. Departmental spokesperson Ismail Mnisi says the Minister is appealing to all road users to obey the rules of the road. On February 25, six people died at Kameldrift on the Gauteng side of the Moloto road. Subsequent to that, another head-on crash occurred on Thursday on the N1 between Marian Hill and Hammanskraal. The crash resulted in five fatalities. Another head-on collision leading to five fatalities took place on Saturday on the R57 between Heilbron and Sasolburg in the Free State. The post Drivers urged to obey rules of the road appeared first on SABC News – Breaking news, special reports, world, business, sport coverage of all South African current events. Africa's news leader..